There is something elementally satisfying about a great barbecue sauce. This dish will be a favorite, for both its ease and its flavors. Plus, it’s rich in tart cherry juice that is so good for you and helps to relieve your aches and pains after a long day. Combine all the ingredients for the sauce in a pan and bring to a low simmer. Add the tempeh and continue to simmer for 30 minutes. Steam the green beans and carrots for 5 minutes until the vegetables are cooked yet still retain a bite. Transfer to a large bowl and combine with the sauce and tempeh. Mix gently. 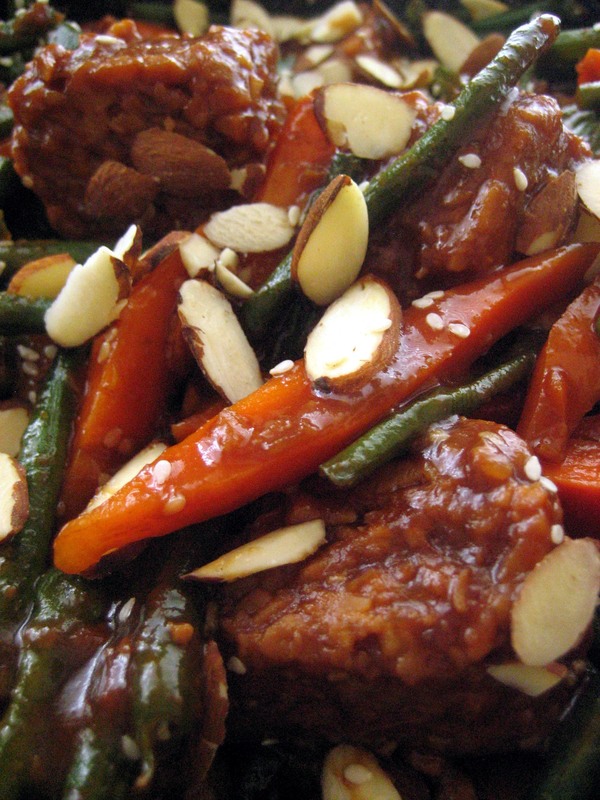 Garnish with sesame seeds and almonds. Serve over brown rice or udon. Sounds delicious. Not too tart, eh? No, not too tart at all with the hoisin sauce etc in the mix. I don’t see why you couldn’t. If you need to add some sweetness to it, I’d just goose it a bit with more hoisin.